Customer satisfaction with restaurants is up. Thank the robots. Americans are spending more dining out and apparently enjoying the experience more, thanks, in part, to new technologies. The restaurant industry rated 79 out of 100 points in the American Customer Satisfaction Index (ACSI) Restaurant Report 2018, up nearly 2 percent from last year. The improvement, at both full-service and fast-food establishments, resulted from higher scores for courtesy of the waitstaff, food and beverage quality, variety of the food and beverages offered and the speed with which the order was taken. “Restaurants are working hard to please their consumers … and it’s paying off,” said ACSI Managing Director David VanAmburg. They’re updating menus – more offerings and better-quality fresh food – and adding technology, such as mobile ordering and automated kiosks, he said. “Technology is being used to make the dining experience, including takeout and delivery, more efficient and faster,” VanAmburg told NBC News. It’s not just millennials. “Acceptance of the more common types of consumer-facing restaurant technology – such as online ordering, kiosks and mobile interaction – appears to be gaining ground among consumers of all ages,” according to the National Restaurant Association’s 2017 State of the Industry Report. One in three customers surveyed said they’re using more restaurant technologies now compared to two years ago. 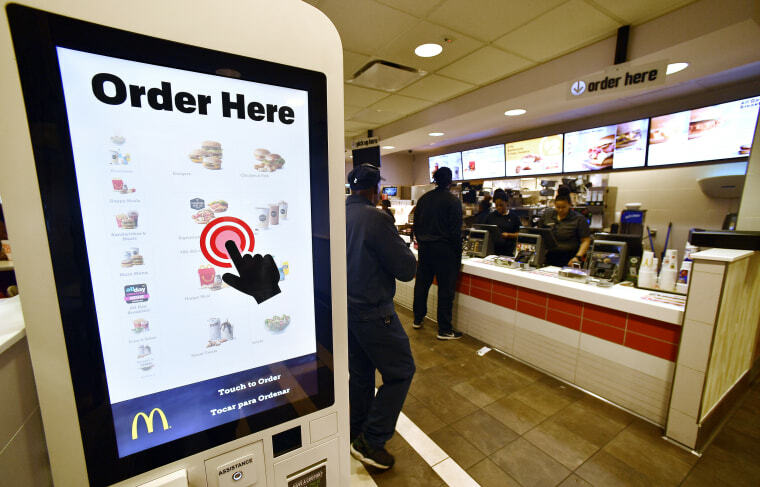 McDonald's, the world’s largest restaurant chain, is investing heavily in tech, adding self-service kiosks to its 14,000 U.S. locations. The company plans to upgrade 1,000 stores with kiosk and mobile order technology every quarter for the next eight to nine quarters. “We're introducing many options,” CEO Steve Easterbrook told CNBC. “They [customers] can order through mobile, they can come curbside and we'll run it out as well as the existing traditional ways. You can pay in different ways and customize your food in different ways. I think we're trying to add more choice and variety." In June, Panera Bread, which considers itself a “digital restaurant,” was named Influencer of the Year by the Interactive Customer Experience Association. Panera says sales by mobile, web or kiosk transactions topped $1 billion on an annualized basis last year. As of the end of Q1 2017, 26 percent of Panera’s total company sales were digital, “the highest rate in the restaurant industry outside of the pizza segment,” according to a report by retailcustomerexperience.com. Guests at The Capital Grille, a national upscale steakhouse chain, now use an iPad to choose their wine. The restaurant chain ditched the paper wine list back in 2014. By going digital, the restaurant can provide tasting notes for each wine, and enable customers to sort the list by regions, varietal, ratings or price. The restaurant’s Concierge App makes it possible to reserve a bottle of wine when making a reservation. Because the list is updated in real time, it eliminates the frustration of ordering a wine and then being told it’s not available. “The iPad technology allows us to always present an accurate list available to the guest during their dining experience,” Brian Phillips, The Capital Grille’s Advanced Sommelier, told NBC News in an email. Dine Brands is reported to be working on a mobile app for its Applebee’s Grill & Bar restaurants. The app, as reported by the New York Post, would let customers pre-order their food, show up at an Applebee’s and be immediately seated, and then pay their bill via the app. “It’s like converting casual dining to fast food,” Steven Joyce, the new CEO of Dine Brands, told the Post. Some smaller restaurants, including Burger Boss in Southern California and Square Roots Kitchen in Chicago, are using order kiosks to great success, according to a recent article in National Restaurant News. Most of the big restaurant chains are taking it slowly. Taco Bell and Subway are currently testing kiosk technology. Research shows restaurant patrons have overwhelmingly embraced technology such as online reservation systems, online ordering, mobile apps and tableside payment. Between 70 and 80 percent of customers say they see a benefit. A 2016 Cornell University study of full-service casual restaurants found that “dining time was significantly reduced” for those who used tabletop hardware to order or pay for their meals. Those who ordered their food this way tended to spend more than those who did not. Associate Professor Alex Susskind, executive director of Cornell’s Institute for Food and Beverage Management, conducted the study. He cautions restaurants to be careful not to turn off customers who don’t feel comfortable with technology. The ACSI report includes ratings for well-known restaurant chains, based on interview with 22,500 customers. Texas Roadhouse tops the full-service category with an ACSI score of 83 out of 100. Cracker Barrel (down 4 percent) and LongHorn Steakhouse (up 5 percent) tied for second place at 81. The ACSI report noted that LongHorn’s reduced menu options and larger steak sizes seem to have paid off in customer satisfaction. Olive Garden (80) took third place. Outback Steakhouse, Red Lobster, Red Robin (up 8 percent) and TGI Fridays (up 4 percent) all tied at 79, below the industry average. Red Robin’s jump in satisfaction was the biggest gain of any restaurant in the survey, fueled by a focus on menu improvements and online orders. Applebee’s, Chili’s and Ruby Tuesday tied at 78. Denny’s (77) took last place. In the fast-food category, Chick-file-A took the top spot for the third consecutive year. It’s ACSI score of 87 was well above the industry average and way ahead of Panera Bread, which scored an 81. The two pizza giants, Papa John’s and Pizza Hut, tied Subway at 80. Arby’s, Chipotle Mexican Grill and Domino’s tied at 79. While Chipotle’s financials continue to improve, “customer satisfaction has not yet returned to the loftier levels prior to the company’s food safety crisis,” the report noted. Dunkin’ Donuts and Starbucks tied at 78. KFC and Little Caesar’s had a 77 and Taco Bell scored 74. When it comes to the big burger chains, Wendy’s (77) dethroned Burger King (76) and beat Jack in the Box (74) and McDonald’s (69). Even though it anchored the bottom spot for the third straight year, customers gave McDonald’s points for its expanded menu – it just wasn’t enough to boost overall satisfaction.